Hi I’m David Kamara, a Foundation student from the Drawing pathway, I’m taking over the Camberwell blog for Camberwell Cameo. The last weeks were a little stressful; everyone was moving work around and the hallways were filled with pieces so that the rooms could be painted. At the same time I have really enjoyed the experience, it’s nice to be surrounded by art and I kind of get a glimpse of what the summer show is going to be like. Everyone’s work is really good and I feel like this year’s exhibition is definitely going to be a really high standard! My final project was focused on void spaces and I was attempting to imitate that phenomenon through paintings and objects. I was heavily influenced by artists like Turner and Rothko because the pieces that they create are so atmospheric that you can almost get lost in the paintings. I wanted to create a piece which sits in a space that whilst it’s small you still feel like you can get lost in it. The piece I’m showing at the Foundation Show is four cinder blocks placed on top of each other, sort of like a totem pole. Carved into each block is a different sculptural design formed using a hammer and chisel. 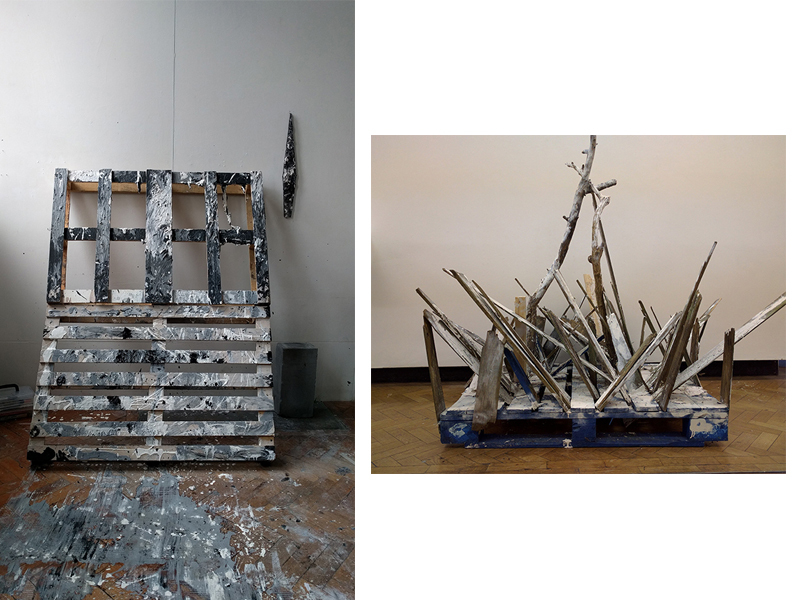 The sculpture sits in a tray of water and is accompanied by a six foot abstract painting. 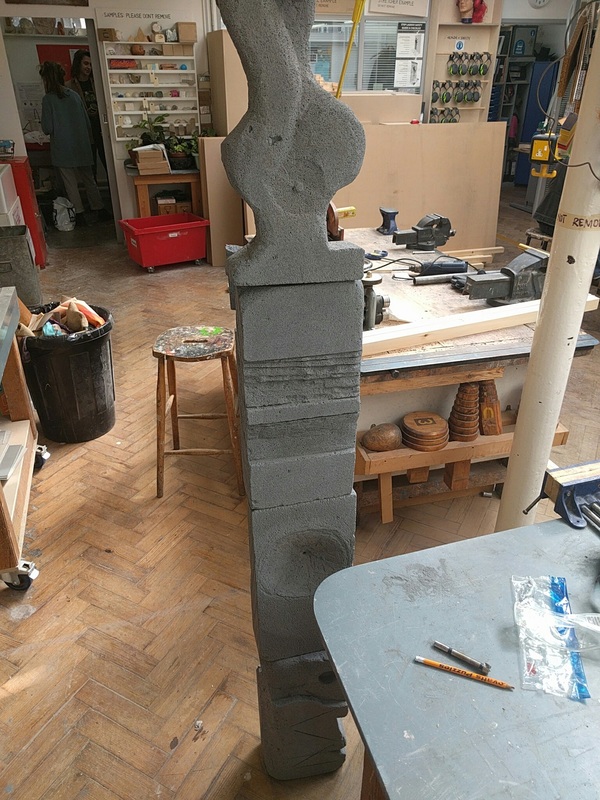 I tend to use raw materials because I like the texture it gives to my pieces, I am currently working with cement but in the past I have worked with a mixture of wood, clay and plaster. I would say that my process is very messy and I like to get my hands dirty. I never use a paint brush, but I use my hands and I usually mix together different materials and chuck/pour/rub it onto the canvas/object I’m working on. For the most part I like to work alone when creating a piece because it helps me to think more clearly and I get into a particular mind-set that I feel I need to produce a good piece of work. 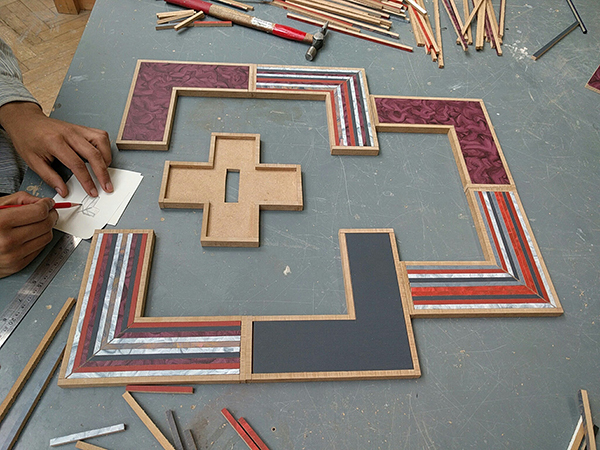 The work I would like to recommend you to look for at the Summer Show exhibition, is from my friend Niccolo Binda, his work is very geometric and incorporates different patterns. His newer works tend to follow a certain symmetry and uses negative space to complete a general form in the piece. But what really appeals to me is his use of colour, he uses subtle colours which are separated by delicate lines. 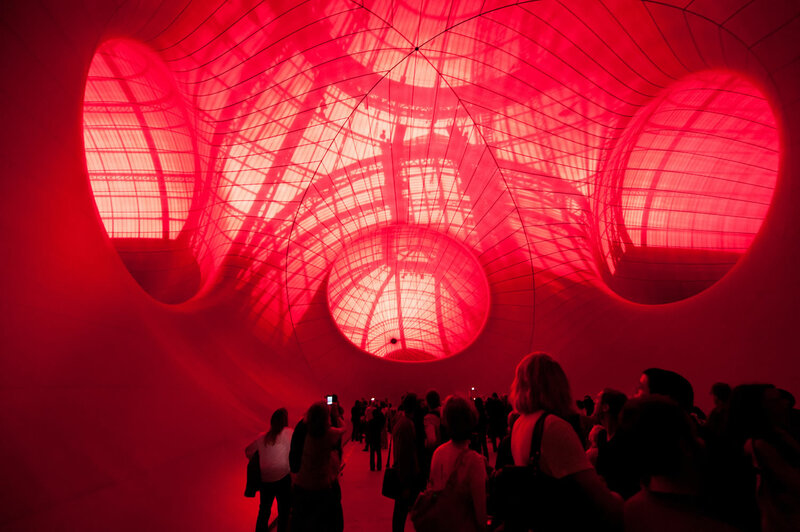 Finally, I would like to share what inspires me; right now I’m interested in the sculptor Anish Kapoor. I love his use of colour and form. His work has a lot to do with voids which relates to my project, in fact he recently got exclusive rights to Vantablack, the blackest black in the world so I’m pretty excited to see what he makes next.